You may have picked out the perfect trailer for your towing needs, but without a proper hitch, your towing efforts and your trailer are useless. Knowing what kind of hitch to buy and having it properly installed is critical to your towing operations. Most people know what hitches are, but it's o.k. we'll explain it here. Hitches are devices that attach to the chassis of a vehicle for the purpose of towing. Here's a picture of a classic hitch. Trailer hitches usually come in two different forms - receiver type and fixed drawbar type. The receiver hitches mounts to the frame of a vehicle and has an opening to receive removable ball mounts, bike racks, cargo carriers and other accessories. 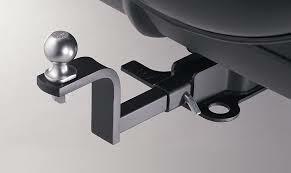 The fixed drawbar hitch have a built in hole and for a trailer ball. Not all hitches are the same, especially when it comes to how much weight you have to pull. To clarify how much a hitch can bear there are classes. When you get above 10,000 pounds then it's time to look at Fifth Wheel and Gooseneck Hitches. These hitches will allow up to 25,000 pounds. Installing hitches can be tricky and needs to be done with extreme care and detail. Improperly installing a hitch can cost untold amounts of damage, money, and unwanted consequences. Refer to the manufacturers' guidelines and instructions for installing or seek a certified professional if you don't feel comfortable doing it yourself. We have service centers in 2 locations that can install your hitches for you. We can also advise you on what hitch will fit your needs. Our sister site Hitches For Less has a wide variety of hitches and trailer parts. Our knowledge and experience in the trailer industry is a valuable resource for all hitch and trailer buyers. Give us a call at 1-888-461-3033 and let us help you select and install a hitch.